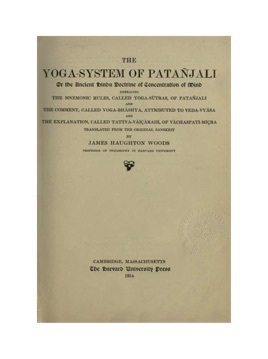 James Haugton Wood's early 20th century translation of Patañjali's Yoga Sūtras is an indispensable guide for Yoga practitioners as well as others interested in the classical Hindu & Buddhist traditions. Wood's translation includes two major commentaries on the Yoga Sūtras by Veda-Vyāsa and Vācaspatimiçra, both indispensable for a proper understanding of the text. Rather than a pure academic interpretation, however, Woods brings another unusual quality to this translation. Besides fulfilling his academic responsibilities at Harvard teaching Indian philosophy and Sanskrit , he himself was considered a guru or teacher of Yoga in Japan. He founded the Japan Yoga Society, translated the Yoga Sūtras into Japanese and had a devout following of Japanese practitioners who to this day still bring flowers to his graveside located above Lake Biwa in the small Midera sub-temple of Homyoin near Kyōto.